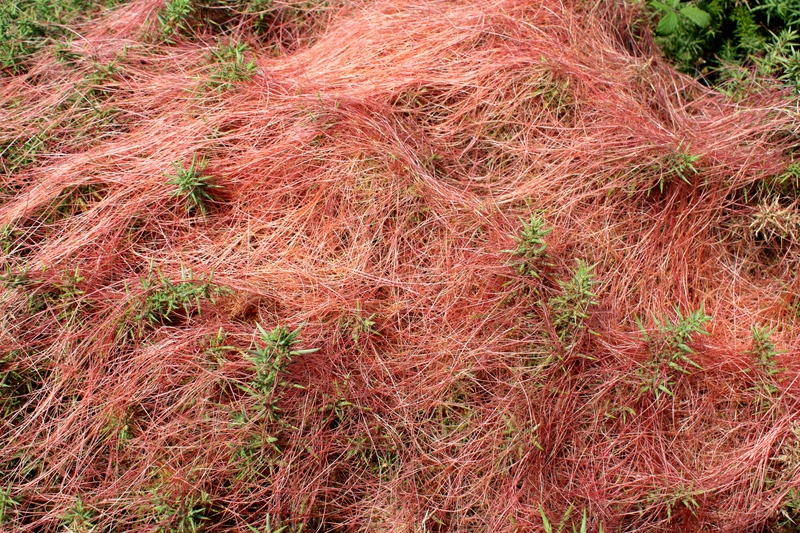 If you’ve ever passed a gorse bush on a cliff top or heath and wondered why it’s covered in something resembling a blanket woven from strawberry bootlaces, then you’ve encountered one of Britain’s most curious plants, Cuscuta epithymum, otherwise known as dodder. Dodder begins its annual lifecycle in spring when it germinates and twines around a host plant, preferably a gorse bush (Ulex europaeus), heather (Calluna vulgaris) or clover (Trifolium spp). Once the dodder has become established its lower stems wither, effectively leaving the young plant high and dry. All is not lost, because suckers on the dodder’s wandering, chlorophyll-free threads penetrate the stem of the host, allowing the dodder to live as a parasite. It then spreads rapidly, often completely smothering its unwitting victim. The whispy, red-pigmented strands are not designed to photosynthesise and become even more interesting when spangled with clusters of tiny pinkish-white flowers in summer. Dodder is one of life’s survivors, a unique energy-sapping oddity which occupies a unique place in our island’s flora. These photographs taken in Zennor, West Cornwall, in September 2014. Well I never! I don’t remember having ever seen such a thing. I will be looking out for it from now on. I guarantee you’ll spot it now. I’ve seen it on St Agnes Beacon and on the cliffs between Chapel Porth and Trevaunance. I think it should still be about at this time of year. 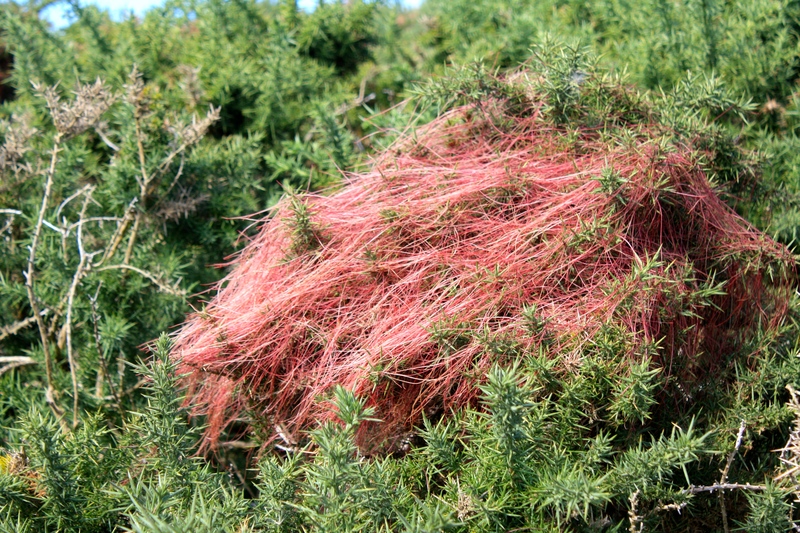 I remember seeing this on a coastal walk many years ago – from a distance I thought someone had left bits of red fluff along the bushes so that they wouldn’t loose their way. It wasn’t until up close that I realised it was a plant, and a fantastic one at that! It is marvellously unusual isn’t it? Seems to have carved itself out a little niche in the natural world. We encountered it on the coast around Heartland. The first thing we noticed was the stench. We were looking under our boots to see who had trodden in something doggy! I believed it was parastic but didn’t know what it was so thanks for the insight. That’s interesting Kay – I didn’t know it was pongy! I might refrain from having a sniff when I next spot it then. Wonderful and a little bit scary, wouldn’t want to have a cliffside nap next to some! Perhaps too much Dr Who on my part?